Turkey sends a jet fighter into Syria's air space. Naturally, it's brought down. And now the war drums are banged in Ankara. 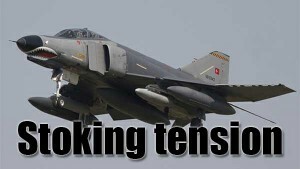 A collection of references to jet fighters that fly over Syria has created some tension in Turkey. Ted Obvious reports from all over the world.